Once again, I delve into the arena of the old and dredge up an interesting sheet that covers aircraft of an Air Wing; in this case CAW-3 from what seems to be the 1970s. There are lots of kits in 1/72 to cover these subjects. 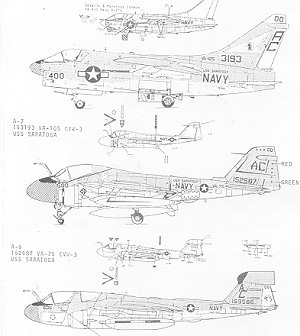 The A-6E is available from Hasegawa, Italeri and Fujimi to name a few. The EA-6B from Hasegawa and Matchbox, while the A-7E has been done by Airfix, Italeri/ESCI and Fujimi. There are undoubtedly others who have kits out or have reboxed these, but the ones mentioned are more readily available. All these subjects are in the gloss light gull grey over white schemes. So what is on this sheet? Next is an A-6E from VA-75. This is also a CAG bird with multicolored stars on the fin. This A-6E has not yet been equipped with the FLIR pod as part of the TRAM set-up. The final option is the EA-6B from VAQ-138. Not a CAG bird, but still pretty colorful. 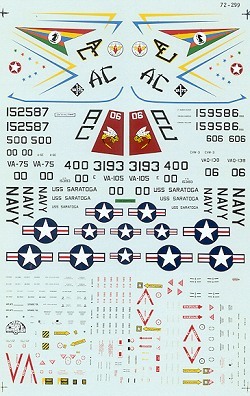 The sheet includes insignia and common markings for all, though some of the smaller insignia seem to have the red a bit off register.